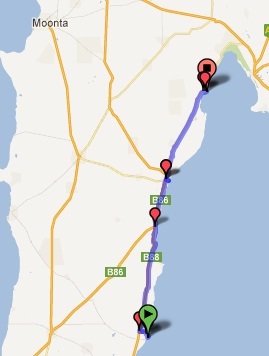 A slight revision of the route back home yesterday found us staying in Port Clinton rather than Ardrossan as we are now no longer going to Kadina to pick up supplies we will pick them up along the way in Balaklava and Nuriootpa. So we were a little late in starting this morning ... for one we overslept and for another everyone kept chatting to us and this stopped us from packing up! One thing we did learn is that the other day when we had the wild winds this caravan park really suffered in those high winds. Generally most people put their roll away awnings in at night as they don't like the strong winds, well not too many did and got caught in the early morning winds of Monday and quite a few vans had their awnings ripped and some even ripped off! Some of the park was more exposed to the full force of the wind (remember we were quite sheltered at the Yorketown caravan park due to the embankment on the footy oval which protected us!) more than others and someone was telling us that everyone spent Monday helping each other holding things down ... LOL I said to Neil that I don't remember the radio saying there is going to be strong winds just 'maybe' thunderstorms ... we knew there was going to be strong winds as we looked at the bureau and Elders which both said 40km winds which is the constant and gusts would get even stronger than that. It must have been placed there breast cancer awareness month! This road was nice until Port Julia and Neil just had to stop to inspect the crop! and then the traffic was incredibly heavy, the road deteriorated and we had some short but very hard undulations for the next 25km to Ardrossan. To make matters worse we were suppose to have a westerly but it was a gentle northerly swinging to the east so we were not happy cyclists. Alot of dickheads today on the roads - trucks going in both directions with loads. We were both relieved to get to Ardrossan for our coffee and we did shout ourselves a bakery item ... didn't feel like anything too sweet so we both opted for a spinach and cheese pastry roll (at $3.90 each!) and it was lovely - you could actually taste the spinach (normally they go easy on the spinach and heavy on the potato!). Ardrossan is quite a big town with a population of around 1100. The supermarket was well stocked so we picked up supplies. We had our break at the end of town where we got a great view of where they store the grain and with its 'zoom slide' down to the ocean where it loads up the ship(s) ... it is a pity they weren't loading ... but I suspect the silos might be empty! So Ray both Port Giles and Ardrossan have wheat storage facilities that also load up the ships. We had quite a long break at Ardrossan and didn't start again until around 1.30pm. We rejoined the highway and funny enough the wind was now back on our left and coming from the west and sometimes even slightly behind us. The road was in better condition, the traffic had eased off and the road flattened out a bit! Sometimes you could see the coast and water and sometimes you couldn't. Port Clinton is not much of a town and it doesn't really have many 'holiday home' type houses here - I suspect because there is alot of mangroves and the tide goes way out and there is no where to launch a boat, so what holiday homes that are here tend to be in this caravan park which doesn't have many tourist sites but also doesn't get many tourists through here! To look at the park it doesn't look like much but it is very basic and has a very clean set of toilets and showers! And my favourite feature of a park ... no one to disrupt us and stare at us and then ask the same questions ... LOL.